Violinist and concertmaster Anita Felix began her violin studies under the tutelage of her mother, Nicholette Fetsch, who is a fellow symphony member. She joined her first symphony at age 16. 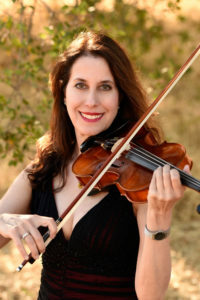 Currently in her ninth season as the Folsom Lake Symphony’s concertmaster, Anita also is a member of the Sacramento Philharmonic and performs regularly with the orchestras of the Sacramento Opera, Sacramento Choral Society and Sacramento Ballet. She was formerly assistant concertmaster of the Stockton Symphony and concertmaster of the Gold Country Chamber Orchestra. Anita’s desire to perform the virtuosic violin and piano chamber music literature resulted in the formation of Duo Concertante with her pianist father, Wolfgang Fetsch. In 2008, Anita joined the Sierra Ensemble, a trio consisting of violin, piano and French horn, with San Francisco Bay area musicians. Sierra Ensemble was invited to perform in Istanbul and Ankara, Turkey, in 2013. Recently Anita has joined with Folsom Symphony oboist Curtis Kidwell and Sacramento State faculy member John Cozza in the ensemble Tres Musicos. Anita coaches the Sacramento Youth Symphony and the UC Davis Symphony Orchestra. She recently completed a master’s degree in music and plans to increase her involvement with chamber music and teach.